ADA accessible portable restrooms are located in the visitor parking lot at 1220 Diffley Road, in the Theater in the Woods and on the north side of the park. Caponi Art Park strives to be accessible to people of all abilities. In keeping with the natural integrity and aesthetic of the land, trails vary in consistency and are surfaced with dirt/gravel or rough granite brick. Courtesy golf carts that accommodate five passengers are on hand during programs to provide rides to and from the amphitheater for people with mobility needs. The Theater in the Woods amphitheater site has extensive flat areas for wheelchair seating; foldable wheelchairs, walkers, etc. can be transported via the courtesy golf carts. Accessible parking with golf cart shuttle service is available during these programs in the main visitor parking lot at 1220 Diffley Road and in the paved parking lot at the Lexington-Diffley Athletic Fields. Courtesy golf carts that accommodate five passengers are on hand during programs to provide rides to and from the sculpture garden for people with mobility needs. Foldable wheelchairs, walkers, etc. can be transported via the courtesy golf carts. Accessible parking with golf cart shuttle service is available in the main visitor parking lot at 1220 Diffley Road. Handicap parking adjacent to the sculpture garden is available in the private parking lot at 1205 Diffley Road. Trails in the sculpture garden vary in consistency and are surfaced with dirt, gravel or rough granite brick. Due to the topography of the land and trails, some sculptures may have limited accessibility. Golf cart tours for people with mobility disabilities are available. Due to the extra staff needed for a golf cart tour, additional charges apply. 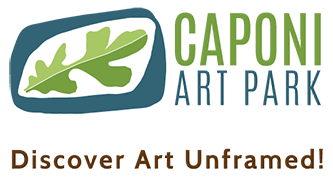 For further questions or concerns about accessibility, please call our office at 651.454.9412 or email us at info@caponiartpark.org.